Diagnostics of cardiovascular diseases on the face. Distress signals from internal organs appear on a skin in one cases simultaneously with illness, in others - long before an illness manifestation that allows to undertake preventive actions in time. For the first time illness diagnostics on face has been studied and applied in China. It was called Sjan-mines or «reading Art on face». Art of Sjan-mines practised great masters who held it in deep secret and only orally transferred the experience to the most presented pupils. In the western countries this kind of diagnostics goes back to times of ancient Greeks. Excellent “readers face” were Gippokrat and Galen, Socrates and Aristoteli. Face the person really is «a soul mirror». The oof of an arsenal of a facial expression, visuality blood supply process, in general, a concentration here the basic sense organs - all it gives the chance to observe affinity of the nervous terminations on face of all processes which are passing in an organism. Any pathological process in an organism - both physical, and psycho-emotional - through subconsciousness changes a facial expression. Skilled doctors on a look can judge a state of health of the person, about its potential of resistibility to illnesses, at last, about character, mentality. Well-known Russian therapist G.A.Zaharin was able to make almost unmistakably the diagnosis on the basis of observation over appearance of the patient. In due time N.I.pie even has made the atlas «Face the patient». He asserted, that practically each disease leaves the characteristic trace on face the person. 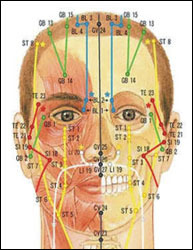 However special diffusion diagnostics method on face (so-called "Fisiognome"), has received in the East countries (especially in China and Korea). Any skilled doctor trained in the Tibetan medicine, will not diagnose without the most careful studying face the patient. Overall picture of changes of a face skin at heart disease. Rather reliable diagnostic sign of a possible myocardial infarction is sensitivity disturbance, up to a numbness of a dermal zone between a chin and a lower lip. If from this zone to rise above presence of a deep fold between a labium and a nose speaks about defect of a mitral valve which, as a rule, has a rheumatic parentage. Here it is necessary to mention, that the beginning heart failure is shown on face by periodically arising cyanosis of labiums. Its occurrence demands emergency measures on hemodynamic normalisation. 8 - additional cords in a nasolabial cord reflect a heart and stomach pathology, and also congenital defects of heart, or the diphtheria transferred in the childhood. One of the important signs of the raised load on heart and circulation organs is the deep and extended nasolabial cord from both parties. The red hilly nose with streaks of blood vessels testifies to the warm pathology accompanied by high level of arterial pressure. 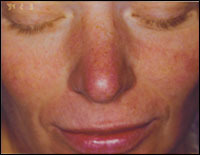 Low arterial pressure is frequently shown by blue-red colouring of a nose. About warm diseases speak also the wings of a nose having blue-red colouring. Pallor of auricles testifies to circulation disturbance with a characteristic wax shade also. Whisky - the important diagnostic zone specifying in gravity of processes occurring in an organism. 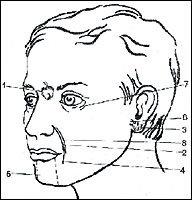 The bent temporal artery acting under a skin having sharp contours, in a combination to a periodic face reddening specify in sharp rising of arterial pressure with a possible outcome in a hypertensive crisis. The condition of a temporal artery described above, in a combination to a blanching of the person testifies to the angiosclerosis of the brain burdened by raised arterial pressure of a renal parentage. Cheeks can serve one of signs of warm problems. At hollowness of the left cheek it is possible to think of illness of heart. Indirect sign of early disturbance of a coronary circulation at young enough age are the premature canities of hair. At the first view its short neck specifies in the person with predisposition to heart diseases. Except problems with heart, for the owner of a short neck threat of an early angiosclerosis of a brain is quite real. 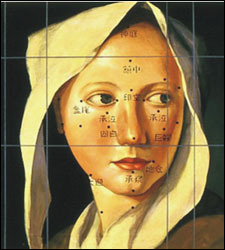 On E.Gonikman, "diagnostics art on face"